Look up in the sky! It's a BOLD new graphic novel about SUPERHERO PETS!Captain Amazing, superhero and savior of Metro City, is getting old. He's out all hours battling arch-villains, catching thieves, and helping little old ladies cross the street. He doesn't even have time for his house full of pets. He needs - a SIDEKICK!Captain Amazing's four pets agree. But each one of them thinks HE should get the sidekick spot - and a chance for one-on-one time with the Captain. 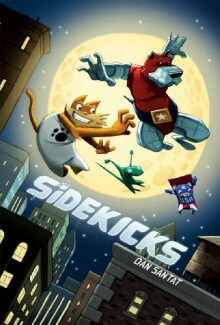 Get ready for sibling rivalry royale as pets with superpowers duke it out for the one thing they all want - a super family.A BOLD and BRILLIANT graphic novel romp by whiz kid Dan Santat.